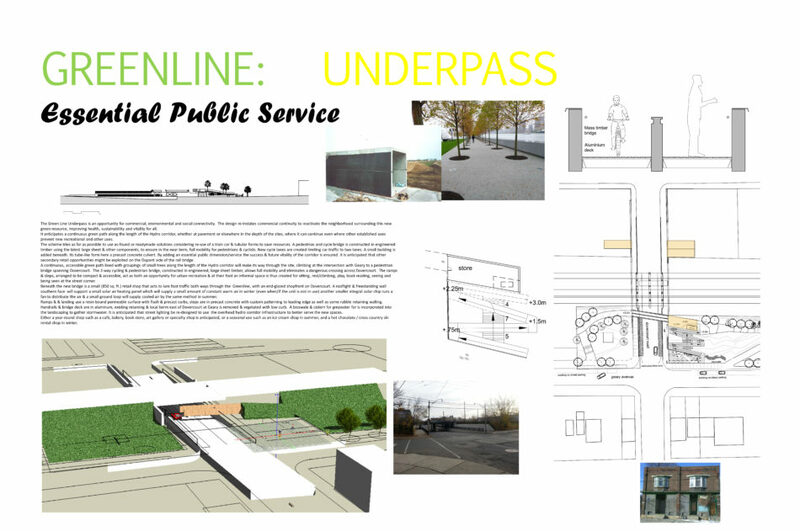 A competition was held for design of a linear park to be beneath some overhead power lines in Toronto, Ontario, running parallell to an active freight line in the city. Existing traffic underpasses running through the corridor were to be re-designed to address some of the problems with continuity & urban interfaces at these points. L1 proposed a number of small informal trading opportunities/community uses to reinstate commercial continuity across the corridor & make the underpass more attractive to pedestrian traffic in general as well as, a bridge constructed relatively cheaply & sustainably from superPLY for pedestrians & cyclists. The emphasis was on increments that could make such a park space possible using minimal resources over time. A folded ramp “Landscape” was proposed for convenient accessibility and a direct, fun way to take in the views of the rail corridor. The proposal was a collaboration with Janis Fedorowick (Landscape) of Wavefront Planning & Design. This entry was posted on Friday, July 8th, 2016 at 12:36 pm. It is filed under Community. You can follow any responses to this entry through the RSS 2.0 feed.